Seriously, it easy and mindless. Looking forward to seeing how it comes out. 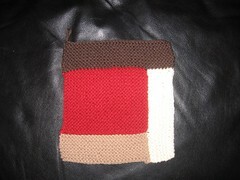 I am using Knitpicks Wool of the Andes. 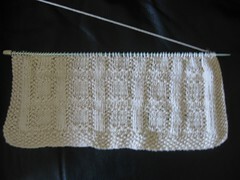 I also started a Moss Grid Hand Towel from the book. This was the first pattern in there that caught my eye. I decided to save a few bucks and am using another Knitpicks yarn, also from my stash, Shine Sport. It's washable, so I am all for it. I've got the Mason Dixon bug. Baby kimonos - for a boy, girl or both? Just a question on log cabin and a HI!